SARANSK, September 29. /TASS/. The first test match at the currently-under construction football stadium in Saransk, which is one of 11 cities across Russia selected to host matches of the 2018 FIFA World Cup, has been tentatively scheduled for April 21, Vladimir Sushkov, a senior local official said on Friday. "According to preliminary data, the first test match will be held on April 21," Vladimir Sushkov, the head of the government of Russia’s republic of Mordovia, told journalists. "However, this date is yet a subject for confirmation." 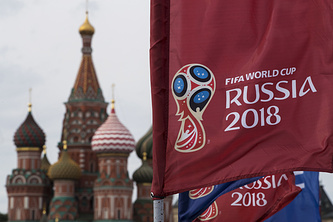 The city of Saransk, the capital of the republic of Mordovia, is hosting on Friday a joint delegation of FIFA and Russia-2018 LOC (Local Organizing Committee), which is currently on the sixth operational visit to assess the readiness of stadiums for the 2018 FIFA World Cup Russia. Between September 26 and October 5, the delegation was scheduled to visit eight Russian cities, namely Yekaterinburg, Samara, Saransk, Nizhny Novgorod, Rostov-on-Don, Volgograd, Kaliningrad and Moscow (Luzhniki Stadium). Speaking about the preparations for the major global football event, Sushkov told journalists that "we do not have much time left and there is still a lot of things left to be done." According to the official, Saransk currently needs to finish the construction of facilities surrounding the stadium, to furnish two river embankments and complete the roads network. "All obligations, undertaken by the authorities of Mordovia, will be implemented," Sushkov stated. The construction of the 45,000-seat capacity Mordovia Arena in Saransk was launched in 2010, the year which marked the 1,000-year anniversary of Mordovians uniting with other ethnic groups across the country. According to the Local Organizing Committee (LOC) Russia-2018 website, the stadium in Saransk was designed in the shape of an oval and its bright range of colors, which combine orange, red and white, should honor the distinctive color palette of Mordovia's arts and crafts. The capacity of the stadium, which is located on a bank of the Insar River flowing through the downtown of Saransk, is planned to be reduced to 25,000 after the 2018 FIFA World Cup with the aim of adjusting the facility for holding other sports events in the future as well as to become a home arena for Mordovia FC. The Mordovia Arena, which was initially scheduled to be commissioned in December, will host a total of four group stage matches of the 2018 FIFA World Cup in Russia. After successfully hosting the FIFA Confederations Cup this summer, Russia is now in full-swing preparations to host the 2018 FIFA World Cup. The country was granted the right for the global quadrennial football championship after winning the bid in Guatemala in December 2010. The victory came following a tight race against the bid from England, the joint bid from Portugal and Spain and the joint bid on behalf of Belgium and the Netherlands.